PHS's Nancy Taylor and Mother Bethel AME Church's Margaret Jerrido. PHS is located in a neighborhood rich with history. Just a short block away is the Mother Bethel African Methodist Episcopal Church, founded in 1794 by Richard Allen, an African-American Methodist minister. The church has been located at the corner of Sixth and Lombard Streets since that time, making it the oldest church property continuously owned by African Americans. The current church building, constructed in 1888-1890, has been designated a National Historic Landmark. 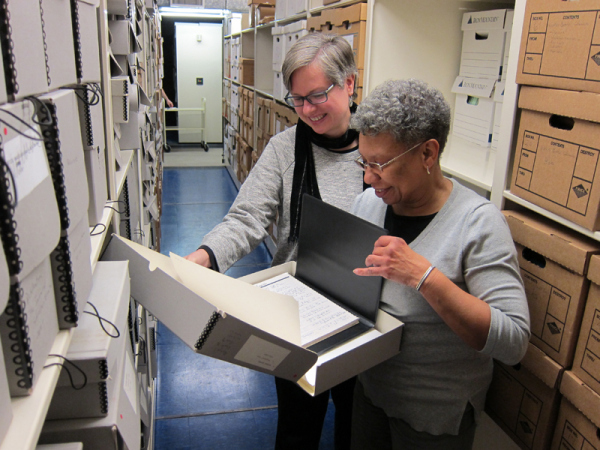 In preparation for upcoming basement renovations at the Mother Bethel AME church, AME archivist, Margaret Jerrido, has worked closely with PHS archivists to store AME’s vital archival records offsite at the Society. To ensure that these records will be out of harm’s way, 154 cubic feet of Mother Bethel AME records arrived on January 8th at their new temporary home here at PHS. Margaret Jerrido will continue to have access to these records and she will serve the AME Church’s information and records request needs while these records are here. The remodeling project at Mother Bethel AME Church is expected to take approximately three years.